Summer’s back and so is that good ol’ Florida heat! There’s not much of a better way to beat the heat on a summer day than to take a nice, relaxing swim in the pool out back. But, there’s nothing more frustrating than getting ready to dive in and seeing all the little bugs that decided to have a pool party too overnight. Or what about getting into the pool and being ambushed by harsh sunlight, making it impossible to swim without sunglasses and 70+ SPF. Well, there are ways to prevent this and make sure you don’t get the swimming pool blues this summer! And it’s so simple that it’s one step, putting up a screen enclosure around your pool! 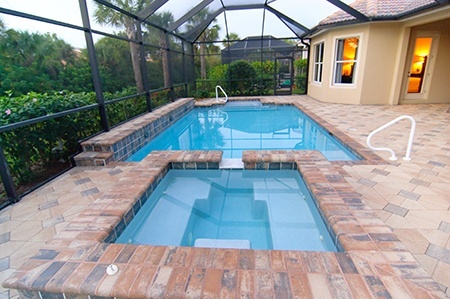 Besides fewer bugs and less harsh sunlight, there are many benefits to adding a screen enclosure to your pool, and we will provide you will all the pros (since there aren’t any cons) here! No unwanted guests! Besides just saving your pool itself from little critters looking for a swim, it stops any undesired creatures from coming onto your deck or any other surrounding area that’s enclosed with the pool. For most places, this usually means squirrels or raccoons, but in Florida, this could mean more significant issues like snakes or even alligators looking to come in to cool off. A properly installed screen will keep these fellas out and on their way. Gives peace of mind. Besides keeping out the critters, if you have small children living in or visiting your home, a screen enclosure ensures safety. As long as everything is set up accurately and all doors are shut and locked, these enclosures will make sure that no one has an accident and ends up in deep water. Filter those UV rays! As stated earlier, screen enclosures make for less direct sunlight while you’re enjoying your time outside. The screen filters the sun, making it less damaging when it hits your skin and also helps keep your pool water cool and not a boiling hot tub on those extra hot days. No flimsy screens! Summertime in Florida also means stormy afternoons. Hurricane season is popping up around the corner, and you need to know if your things outdoors can withstand those forceful winds. These pool enclosures can withstand winds up to 130mph, so they will still be standing even after the storm has passed. Saves you money in the long run. A screen will help your pool water from evaporating on hot days, causing you to add even more water to it and hiking up your utilities. It also saves on energy costs because the screen regulates the water temperature, keeping it under control and at a comfortable temperature. Quality Screen and Aluminum built a porch on my house in August 2016. I was so impressed with the way my needs were satisfied beyond expectations and the quality of the workmanship was superb! Blake Keedy was personally involved with every aspect of the construction, even the work of the contract crews! I would definitely use them again and would highly recommend this business! Just wanted to let you know our panoramic screen and the support structure came through the hurricane just fine! Looks exactly the way it did prior to the storm! Thanks for your excellent workmanship!